Do you want an easy to use car wax with cutting-edge, sophisticated technology that delivers the latest in protection? Meguiars Hybrid Ceramic Wax is the answer. With all-new, advanced Si02 hybrid technology, you get ceramic protection that's so easy to use, you can actually wax your paint as you rinse off your car! After washing and rinsing off the soap, simply spray on Meguiars Hybrid Ceramic Wax and then follow that with a second rinse with a strong stream of water. This final rinse helps to spread and lay down the wax evenly. Dry your vehicle like you would normally with a quality microfiber drying towel, like Meguiars Microfiber Water Magnet Drying Towel. There’s no rubbing or buffing and there’s no curing time. You’re left with ceramic protection and durability well beyond conventional wax and extreme water beading protection. Conventional? No. Sensational? Yes! It's ceramic made easy! This sophisticated formula is an exciting way to easily protect your paint. With , advanced Si02 hybrid technology you get hybrid ceramic protection that’s so easy to use, you can actually wax your paint as you rinse off your car. After washing your paint and rinsing off the soap, simply spray on the Hybrid Ceramic Wax and then follow with a second rinse using a strong stream of water. This final rinse helps to spread and lay down the wax for you. Dry your car like you normally would with a premium microfiber drying towel, like Meguiar’s Microfiber Water Magnet Drying Towel. There’s no rubbing or buffing and there’s no curing time. When done, you’re left with ceramic protection and durability that lasts well beyond conventional wax and provides extreme water beading protection. It really is Ceramic made easy! 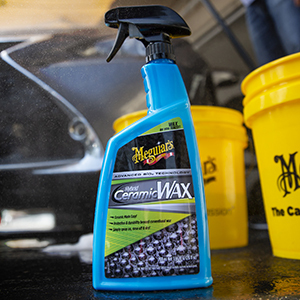 For best results with Meguiar’s Hybrid Ceramic Wax, start with a freshly washed vehicle. Always use a pH balanced car wash soap like Meguiar’s Gold Class Car Wash Shampoo & Conditioner. Next, run your clean, dry fingertips over the paint. If the paint feels rough to the touch this indicates that you have bonded contaminants on top of your paint. These are things like tree sap mist, industrial fallout, road tar, and paint overspray. Meguiar’s Smooth Surface Clay Kit comes with everything you need to safely remove contaminants bonded on the paint and leave it as smooth as glass. Next, evaluate the paint for below surface defects. 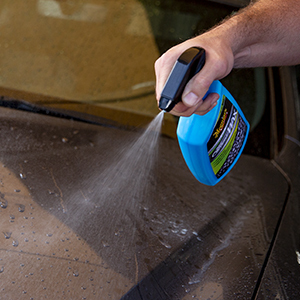 If you have light to moderate swirls, scratches, oxidation, water spots, or etchings you would want to use a product like Meguiar’s Ultimate Compound. Then, you would follow with a polish like Meguiar’s Ultimate Polish for maximum gloss and depth of shine before applying your wax protection. For best results, the car should be cool to the touch and in the shade. Wash your car with any Meguiar’s car wash. Follow the directions on the label. After rinsing the vehicle thoroughly of all wash soap, spray Meguiar’s Hybrid Ceramic Wax over all exterior surfaces. Unlike traditional wax, the surface does not require 100% coverage, as the water will help spread the wax for you. Starting at the roof, use a strong stream of water to rinse the vehicle a second time. This second rinse will help further spread the product, coating all the exterior with our Hybrid Ceramic protection. Dry the vehicle with a quality microfiber drying towel, like Meguiar’s Water Magnet Microfiber Drying Towel. For neglected finishes, manually spread Meguiar’s Hybrid Ceramic Wax with a foam wash sponge after wash sponge, after washing but prior to rinsing. This will form an initial foundation for maximum beading. 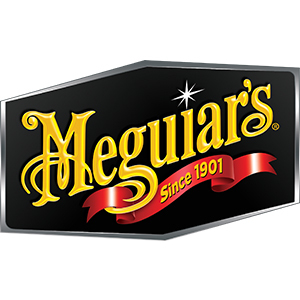 Meguiar’s is one of the worldwide leaders in car care. For more than 115 years, Meguiar’s has provided Car Crazy people with specialized, state-of-the-art formulations for making every car’s appearance show car perfect. Meguiar’s provides high performance car care products for every automotive surface, both on the interior and exterior of cars. 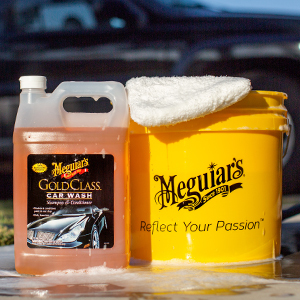 The car care experts at Meguiar’s are dedicated to making sure customers get the premium results they are looking for. To learn more, visit our official website.